Bernstein, born in Lawrence, Massachusetts, was interested in the piano at a very young age. As a child, he took piano lessons and later, during his time at Harvard University, began to write and conduct musical scores. This period was a crucial one with regard to his future career. At Harvard University, he met American composer Aaron Copland whose music he enjoyed playing very much. He also met conductor Dimitri Mitropolous whose charisma and power had a major influence on Bernstein’s decision to go to the Curtis Institute of Music and never give up conducting. 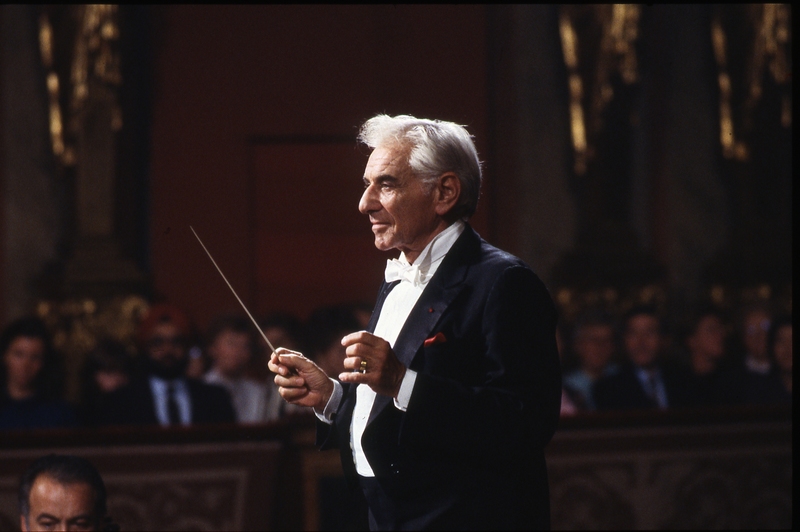 After he left Curtis, Bernstein did a lot of guest conducting, summer schools, and made his first overseas appearances as a conductor. It is during this period that he emerged as a composer. One of the early highlights of his career is his work with the Young People’s Concerts. This preexisting series of classical music concerts for a family audience was brought to a new level by Bernstein in 1958 with the New York Philharmonic. He conducted a total of 53 performances, and he inspired generations of musicians and music-lovers all over the world. Every performance had its own topic and Bernstein, who already worked as a lecturer at that time, made the series a pleasure to watch. The second highlight worth noting is the operetta Candide that premiered in 1956. The story is based on Voltaire’s novella of the same name. The first run of performances on Broadway was not an enormous success, but this piece is now one of the signature works of Bernstein and librettist Lillian Hellman. The overture to Candide, the instrumental opening, soon earned a place in the orchestral repertoire. One of the reasons for its timelessness is the performances of this overture that Bernstein himself did with the New York Philharmonic. During the same period, Bernstein was already working on the music of one of the most famous films and musicals of all time West Side Story. The story, set in New York City’s Upper West Side neighborhood in New York City was written by Arthur Laurents and inspired by Shakespeare’s Romeo and Juliet. The musical explores the rivalry between the Jets and the Sharks, two teenage street gangs of different ethnic backgrounds. Tony, a former member of the Jets, falls in love with Maria, the sister of Riff, the Shark’s leader. The dark theme, sophisticated music, extended dance scenes, and focus on social issues marked a turning point in American musical theatre. This is why the original broadcast production of 1957 was nominated for six Tony Awards. In 1961, Robert Wise directed the film production of West Side Story starring Natalie Wood, Richard Beymer, Rita Moreno, George Chakiris, and Russ Tamblyn. The film was nominated for eleven Academy Awards and is still be regarded as one of the best movies of all time. The score to West Side Story contains major hits such as “Maria”, “Somewhere, America”, “Tonight”, “I Feel Pretty”, and “One Hand, One Heart”. That same year, Bernstein prepared an orchestral suite of highlights from the musical titled Symphonic Dances from West Side Story. This orchestral suite also has a big place in the orchestral repertoire and is very popular all over the world. Bernstein died in his apartment a few years after announcing his retirement in 1990. He left us an enormous repertoire, and many recordings; not CDs, but also films on that are available on DVD or for broadcast. Stingray curated a selection of Bernstein’s works to celebrate the great American composer and conductor. Recordings are always available on the classical Stingray Music channels. For the special broadcasts and regular schedule of concerts by Bernstein, please consult stingrayclassica.com or stingraybrava.com. For the special broadcasts and the regular schedule of concerts by Bernstein please take a look at stingrayclassica.com or stingraybrava.com. Click here to consult the special Bernstein programs on Stingray Classica. Click here to consult the special Bernstein programs on Stingray Brava. You can also watch programs featuring Leonard Bernstein on our On Demand services via Amazon or Comcast.